Top 10 skincare favourites of 2016 featuring Omorovicza, Oskia, Korres & more! Yesterday, I posted about my top 16 makeup products of 2016 and today, it is time for me to share my top 10 skincare products of 2016 - some have been 2016 discoveries and some are long term loves. All are products that I cannot see myself being without for the foreseeable future. 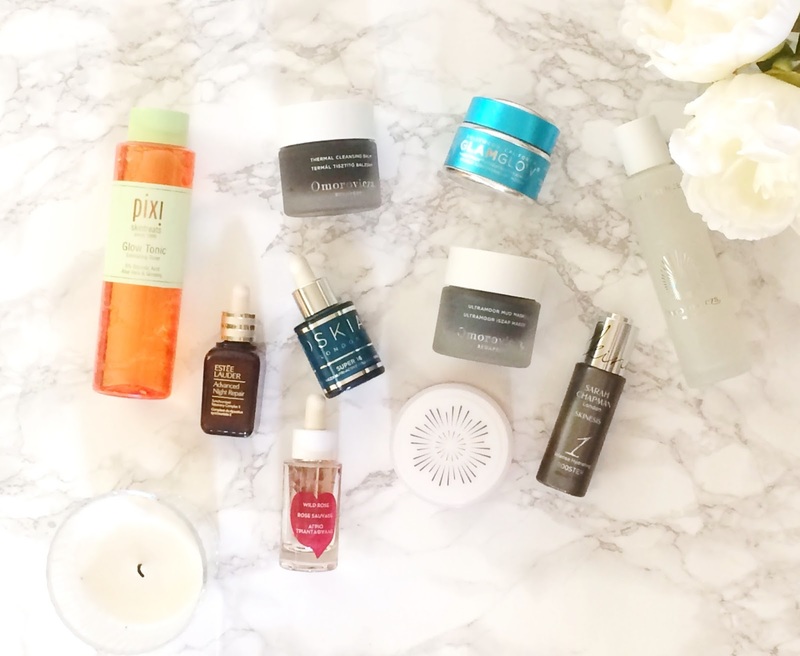 It was very difficult to narrow it down to just 10 because I am a skincare addict but these definitely jumped out at me when I started to think about this post! For reference, I have dry and quite sensitive skin. I have quite a few cleansers in my collection but the one that I repeatedly repurchase and really love is Omorovicza Thermal Cleansing Balm. Balms are my favourite type of cleanser and this one is so gentle, yet it really cleanses my skin but does so without stripping it. It is a pleasure to use due to how soft it leaves my skin feeling. It is also brilliant at dissolving even the heaviest of eye makeup, without stinging my eyes. It is pretty pricey, but worth every penny! The only acid toner that I use these days is Pixi Glow Tonic, which has been a favourite since I began using it over 2 years ago. It is gentle enough to use on a daily basis but effective enough to keep my skin clear, soft and bright. I love the fresh scent, it's pretty affordable and lasts a long time. This had to be in my top 10! Omorovicza Omoressence is a product that regular readers will know I love! Since I started using this, I no longer suffer from dehydration. It really is a wonder product! I apply it after my cleanser, acid toner & hydrating spray, then allow it to works its magic for a few minutes before following up with the rest of my skincare regime. A few drops is all it takes so although pricey, the bottle should last a good 9 months. It was difficult to choose my favourite serum because it is probably my favourite skincare category, so I didn't choose just one! First up is Oskia Super 16 Advanced Nutri-Active Collagen Serum, which contains Bakuchiol, which is natures answer to retinol. As someone with sensitive skin, I used to worry about using retinol, but I haven't had any problem with this serum - it is gentle, yet effective and doesn't leave my skin flaky as some retinol products do. Instead, I have soothed, fresh looking skin with less visible pores. Another serum that I had to include is Sarah Chapman Intense Hydrating Booster, which I have loved since I first began using it (this is the case with every product in this post!). It delivers a powerful dose of hydration and the silky oil/water texture instantly soothes and plumps my skin. The hydrating effects can be felt for hours afterwards but it doesn't leave my skin feeling greasy at all. I adore this serum! My number one skincare favourite of all time is Estée Lauder Advanced Night Repair. Again, this is a product that I have raved about many times so I won't bore you too much but this product does it all - repairs, soothes, plumps, hydrates and diminishes the appearance of fine lines. This will be forever repurchased! I have quite a few oils but one that has made it into my daily routine is Korres Wild Rose Facial Oil. It has a light texture, yet it is very moisturising but not at all greasy. I've been wearing this either instead of, or with, moisturiser every day for the past few months and my skin looks so much brighter and feels supple as a result. You all know that Oskia Renaissance Mask is one of the best I've ever used. It leaves my skin bright, smooth, soft, refined and glowing - what more could I ask for? If you have texture issues, dry skin, visible pores, scarring, blocked pores or all of the above, then you will love this mask! It is a wonder product and a staple in my routine, that I have repurchased several times. Another mask that I had to include is Omorovicza Ultramoor Mud Mask, which I describe as 'Spanx for your face' - it really firms, lifts and tightens the skin at the same time as decongesting pores and brightening the skin. The result is firm, glowing skin that looks like you've just had a facial! The final product is another mask but I had to include it because it is the best hydrating mask that I have used - it is GLAMGLOW ThirstyMud. Another product that I have repurchased more times than I can remember. I apply this caramel-scented mask at night and leave it to work overnight. It isn't sticky so I don't need to worry about peeling my face off my pillow case and it really plumps my skin and moisturises it, leaving it comfortable, soft and glowing. It's a staple in my routine now and I couldn't be without it! I would love to hear what your favourite skincare products from 2016 have been? Could you narrow it down to 10? Please tell me in the comments below! Omorovicza kindly sent me the Ultramoor Mud Mask & Omoressence, Korres kindly sent the oil to me and Oskia kindly sent me the serum - all other products were bought by me. Opinion is always my own.